Southern California American Indian Resource, SCAIR, welcomed San Diego Urban Tribal TANF participants to a Holiday luncheon. 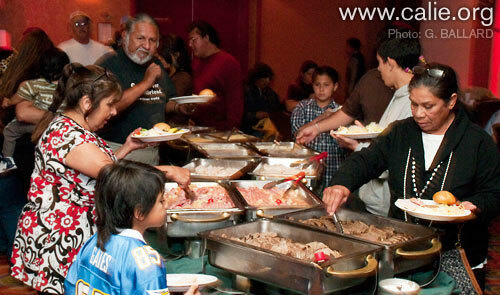 Sponsored by the Southern California Tribal Chairmans Association there is plenty of good cheer, gifts and feasting to be enjoyed on the Viejas Band of the Kumeyaay Indians land this Sunday, December 14, 2008 from 10:30 am to 3pm at the Viejas Dream Catcher lounge in Alpine. There is a very impressive wall of gift-wrapped presents across the stage of the Dream Catchers private meeting room. Cutlery sparkled on the covered tables as the holiday seasons music filtered into the festive gathering. Candy and beribboned centerpieces established a special festive atmosphere for the fun filled schedule of events. SCAIR Senior advisor Randy Edmonds opened the afternoons activities with a prayer for all this holiday season and for all who could not be there for reasons of distance or health. He then introduced Bill Johnson, SCAIR Board President for additional words of welcome and appreciation of the opportunity to be a part of the festivities. 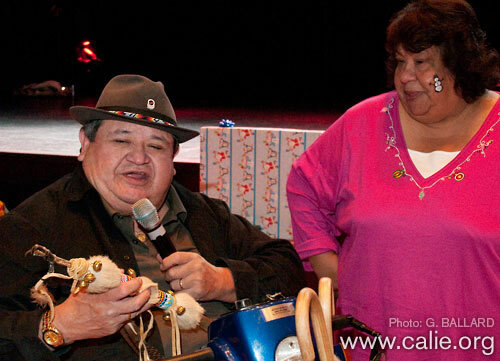 Soaring Eagles coordinator and San Diego Unified School Indian Education Title VII community liaison Vickie Gambala presented a special gift to Ernie Salgado on behalf of the parents and children of the Soaring Eagle Dance and Regalia class. 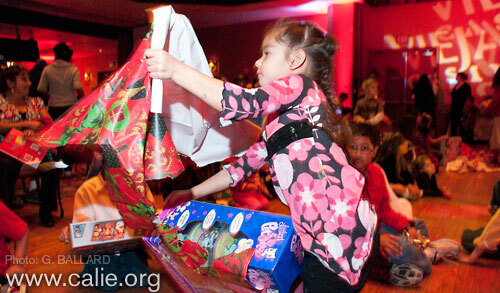 The Gourd stitch decorated dance stick is a symbol of position and privilege. Topped by a claw and wrapped with strips of fur the dance stick is further decorated with two feather drops. Ernie was proudly appreciative of the thought and the gift. Lunch immediately followed with the call, Elders First! This is a fine hot generous selection of roast beef, ham in pineapple sauce, sliced turkey, fried rice, potatoes and gravy, steamed squash and tossed salad with a selection of dressings also rolls and butter. Later there is a tempting table of pies, decorated cake and selections of yummy buttery cookies. Entertainment is provide by Kim Flying Eagle. He demonstrated a variety of Plains Fancy Dancer steps. 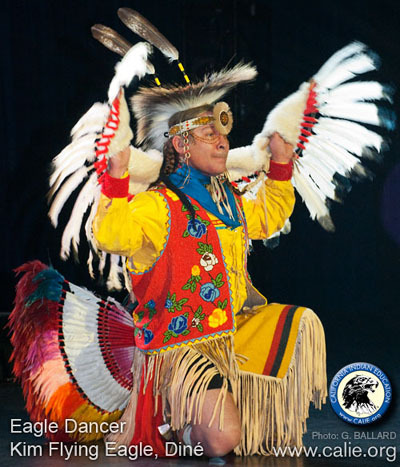 His two specialties were a modern choreographed Eagle dace and a 24-hoop selection of designs and movements from nature and the world around us. His finale assembled two worlds of hoops. The sounds of bells kept ringing as Santa Claus came out, that Red guy with the sack over his shoulder. He called all the children to gather around him as hid elves helped read off the names on the gaily wrapped gifts. 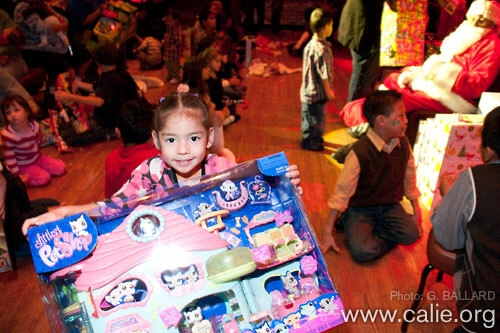 There are spectacular gifts, enormous boxes, screams of excitement and joy over their gifts. Here and there are piles of wrapping paper and ribbons, children riding and playing with the presents, sharing and having a wonderful time. There are outstanding smiles and lots of giggles of joy. This is a real fun place to be even if you think you are the Grinch. Even you too will smile at the end of this good day. 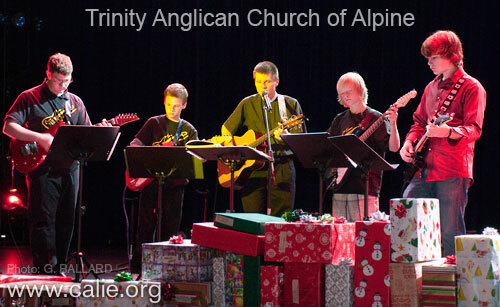 Finally, a youth guitar class of students led by Father Akers from Trinity Anglican Church of Alpine took the stage and sang songs of the Holiday Season. 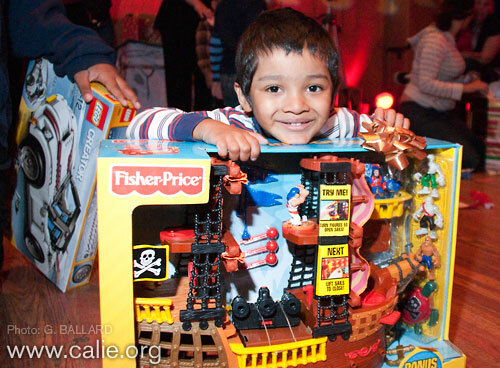 It is great fun until it is time to say goodnight to all and Ho, Ho, Ho from SCAIR this year. Thank you, Aho, Mehan.